Omar Hernandez becomes the second Chattanooga FC Academy player to sign with Atlanta United's Development Academy. Hernandez is the newest addition to ATLUTD's U19 team, which is the top of the pyramid for the youth side of the club. He has already committed to play soccer for Wake Forest University next year. He will spend his senior year in the MLS club's system to make him more prepared for the college soccer experience. Hernandez announced the decision on social media saying, "Truly blessed to say I have signed for ATL UTD Academy!!" He credits his opportunities to training with Chattanooga FC Academy every week. "They have prepared me by showing me how to take my game to the next level," Hernandez said. "The (CFCA) coaches there have pushed me to become a better soccer player every single practice. The have improved my decision making and my positioning on and off the ball." CFCA executive director Matt Yelton expects the momentum for high level players to continue with the club. "Omar earned this on his own, and we are honored to know CFC Academy coaches could be part of his development." Despite his talent on the soccer field Hernandez is quick to say his top priority is to get a degree. That does not mean his goals for soccer are not still top of mind. "My goals for soccer are to become a better player every single day and to learn from my mistakes and most of all listen to my college coaches on what they will tell me. I’m going to try my best to become a professional soccer player after college." Omar Hernandez also played for Dalton High School. He was named Gatorade Player of the Year for Georgia. As part of the recognition, he received $1,000 to give to the organization of his choice. Hernandez generously donated this to the CFC Academy scholarship fund which will help more players benefit from training in a club soccer environment. 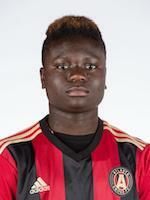 Former CFC Academy player Joseph Collins is part of ATLUTD's U15 team. For the 2017-18 season, Collins played in 32 games and started in 28. He plays forward and scored 10 goals. The ATLUTD Development Academy is the highest level of youth soccer programming in the U.S. by providing a 10-month season. The Development Academy establishes a pathway from youth to professional by integrating the academy within a professional club. The day-to-day environment fosters the pursuit of excellence. Players receive support in areas of medicine, sciences, performance, and advising. Early development of players like Hernandez and Collins is made possible by sponsorships. If you or your business would like to support the continued growth of high-level soccer in Chattanooga, let us know. CFC Academy is a 501(c)3 organization.